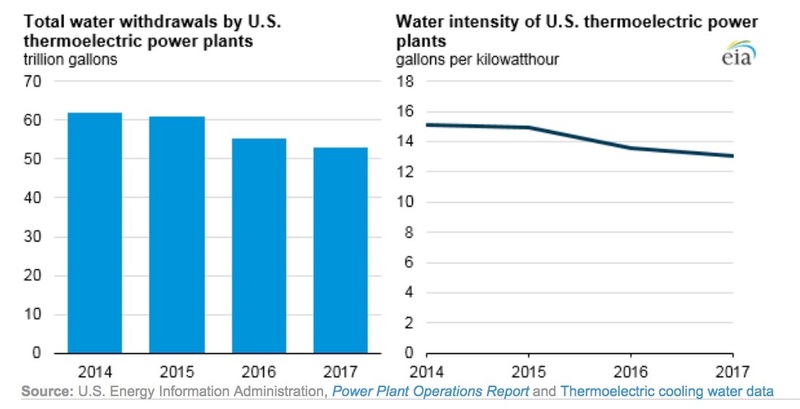 A new U.S. Energy Information Administration (EIA) report reveals U.S. power plants have used less water every year since 2014, thanks in part to a transition to natural gas. According to the report, withdrawals by U.S. thermoelectric power plants totaled 52.8 trillion gallons in 2017, continuing a steady decline that began in 2014. In addition, water intensity of U.S. power generation – the average amount of water withdrawn per unit of total net electricity generated – has fallen to 13 gallons per kilowatt-hour, nearly a 14 percent decreased from 2014. Data compiled by researchers from the University of Colorado at Boulder and National Renewable Energy Laboratory also shows that natural gas-fired power generation uses between 60 and 70 percent less water than other baseload power sources on a gallons-per-megawatt-hour (gal/MwWh) basis, accounting for production through consumption phases. 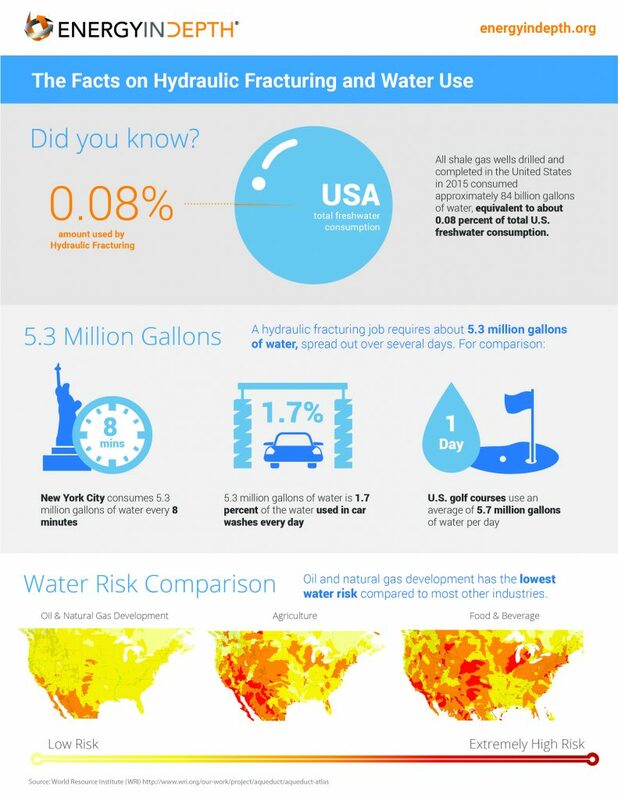 The new EIA report also provides context on the issue of water use for fracking, which has been in the news of late. Contrary to alarmist headlines, water use for fracking represents just 0.08 percent of total U.S. freshwater use. So when taking into account the water use reductions made possible by increased natural gas-fired power generation, shale development ultimately saves far more water than it uses. For example, University of Texas researchers have estimated that the use of natural gas to generate electricity saves the Lone Star State a net 33 gallons of water for every gallon used statewide in the fracking process. Despite “Keep It In the Ground” activists’ attempts to paint the industry as gluttons for water, last week’s EIA report is just the latest example of how shale development actually helps reduce overall water use through increased natural gas-fired electricity generation. Along with enhanced energy security and emissions reductions made possible by shale development, it is abundantly clear that fracking is a win-win for the environment and economy.